Brian is the CTO at One Mighty Roar, based out of Boston, MA. We’re proud to announce the latest addition to the One Mighty Roar network. Introducing Desktopped, a community of computer enthusiasts, PC builders and case modders showing off their home computer setups. 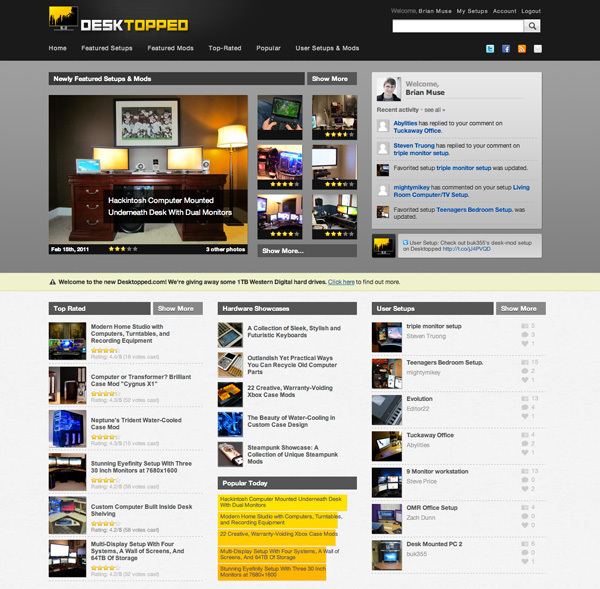 In August of 2009, Desktopped began as a simple wordpress blog which featured inspiring home computer setups and case mods. Over the last two years, it has steadily grown into a large community of like-minded computer enthusiasts, PC builders and case modders. Today we’re proud to announce that Desktopped.com has become a part of the One Mighty Roar network. Desktopped has just relaunched itself into the One Mighty Roar network with a brand new version of the website that brings the focus from editor-featured setups to a new user-driven community. Do you have a home computer setup that you’d be proud to show off? Join up, create your own computer setup profile page, and become a part of the discussion. Desktopped is easy to become a part of, supporting Google’s Federated Login (based on OpenID), Facebook OAuth and traditional registration. There are already over 200 featured setups and a quickly expanding collection of users’ setups – make one of them yours. With all its new polish, Desktopped is still constantly being improved behind the scenes. We’d love to hear your ideas and feedback regarding the user experience and design. Let us know what you think by posting a comment here or emailing [email protected]. Be sure to stay updated with all the latest content. Connect with Desktopped via Twitter, on Facebook, or by subscribing to its RSS feed. We look forward to expanding our community of designers, recording artists, programmers, gamers, and all other computer hobbyists. Once you’ve officially joined the Desktopped club, toss a link to your setup’s profile in the comments below and we’ll can admire accordingly. Looks good. Hope is does better than http://www.deskography.org/ . I remember when this first went online! Great site in the day, probably even better now. I’ll have to get back into Desktopped. You have to believe in yourself . That’s the secret of success .